It is important for Vermonters who are affected by Lyme disease to be aware of the controversy around diagnosis and treatment, so they can make informed choices about their health care. Medical professionals in Vermont approach the diagnosis and treatment of Lyme disease in different ways. Some professionals and institutions believe a CDC positive blood test, or an EM rash, must be present to diagnose Lyme disease. Others understand that symptoms may be present without a rash, and the timing of Lyme blood tests, or use of prophylactic antibiotics, can affect test outcomes. It is also important to diagnose other pathogenic diseases. Anaplasmosis, Powassan virus, Erlichiosis, and other tick-borne pathogens have been found in Vermont. 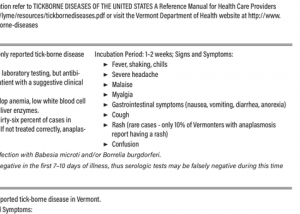 Vermonters who remain ill after treatment for Lyme disease may have infections such as Babesia or Bartonella that require different treatment. Lyme disease may present in a traditional way, with joint pain, fevers, and a bulls-eye rash. Tick-borne diseases can also present as emotional difficulties, memory loss, vision problems, or extreme tiredness – without the presence of joint pain, or a bulls-eye rash. 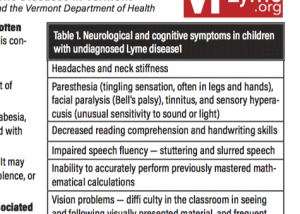 In children, a tick-borne disease may mimic ADHD or learning disabilities. Some practitioners see Lyme as a simple infection easily cured by a short course of antibiotics. Others have patients who have experienced Lyme as a complex disease that requires comprehensive treatment. People with tick-borne diseases may be misdiagnosed with other diseases including mood and anxiety disorders, heart problems, Lupus, Fibromyalgia, Chronic fatigue syndrome, Arthritis, and more. 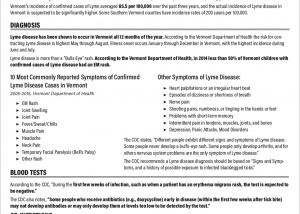 Not all Vermont physicians have accurate information about diagnosing and treating Lyme disease. It is okay to ask your medical practitioner about their training, and how they choose to diagnose and treat Lyme and tick-borne diseases. Vermont doctors may attend physician trainings that offer additional perspectives and information to consider, along with CDC/IDSA recommendations.